My well-chronicled frustration with Microsoft’s corporate strategy comes down to one point: I don’t think any company should have both horizontal (i.e. services) and vertical (i.e. devices) businesses. It creates conflicting incentives: a horizontal business should be great on every platform, while a vertical business should be differentiated. I suspect it was my enthusiasm for this new model that led to my shock at the news that the Microsoft Office iPad apps would no longer need an Office 365 subscription to unlock most of their functionality: what good is a services business that isn’t actually trying to make money? Over the last few days, though, a different model for Microsoft has emerged, and it’s one I’m pretty excited about; the company just hasn’t gone far enough. So strongly do I believe in the importance of incentives – and the problems of bad ones – that this summer I called for Microsoft to split itself in two to ensure that the Services side of the company could grow unfettered. Much to my surprise, though, last week’s announcement reveals that a fundamental cleavage has in fact occurred: today’s Microsoft is, more than ever, two different companies. The line of demarcation, though, is not services and devices, but rather enterprise and consumer. First, though, a quick aside: Microsoft will continue to make money from traditional Windows and Office licensing for both enterprise and consumer for a good long time; that money, though, is a result of previous strategic decisions. For the rest of this article I am focused solely on growth opportunities – the areas where today’s strategic decisions impact tomorrow’s top and bottom lines. And, in that light, by making Office for iOS and Android (mostly) free, Microsoft is effectively giving up on for-pay consumer services. Sure, the company will continue to offer Office 365 for both Mac and PC, but the potential growth has always been on mobile. 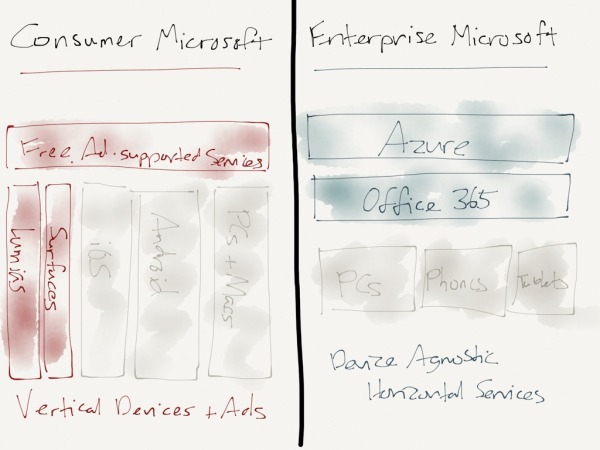 Microsoft’s business makes much more sense if you think of there being two completely separate entities. This leaves this decision neither here nor there, and reeks of short-sightedness: by releasing most of the functionality of Office for free, Microsoft is giving up on the iPad as a growth driver for Office 365, but it seems like they can’t quite wean themselves of incremental income from Office diehards. The problem, though, is that not only could this limitation manifest itself as incremental annoyance, it also limits the defensive utility of this move (members-only). If the worry is people getting in the habit of not using Office at all, why tempt them? The more interesting question is how long this cleavage will be sustainable. Enterprise Microsoft is doing exceptionally well: its Windows, Office and on-premise Server businesses are throwing off cash, while Office 365 and Azure grow like gangbusters. The consumer side of things is the opposite: Lumia and Surface continue to bleed cash2, the Xbox One is struggling, and while Bing is improving, it’s still not a moneymaker. 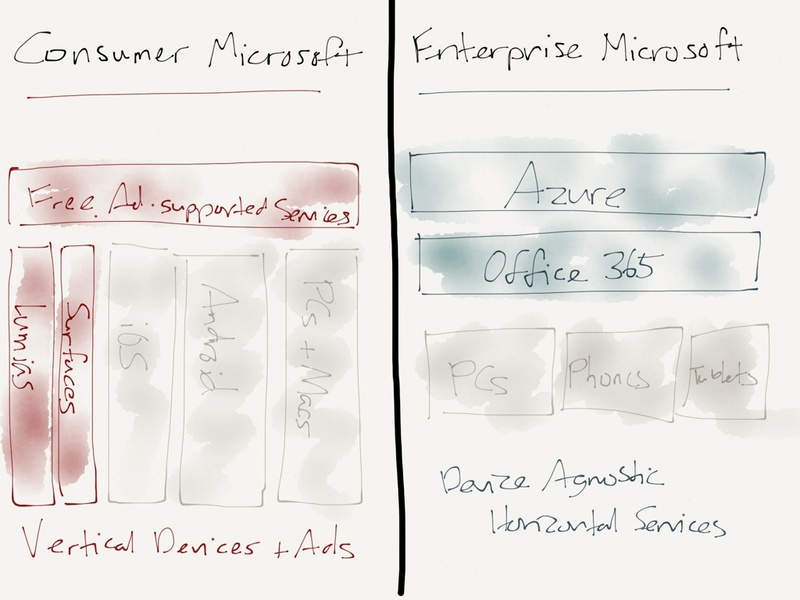 None of this should be a surprise: Microsoft has always been an enterprise company that primarily succeeded in the consumer space by dint of its Windows monopoly. There’s no reason for them to be any more successful with consumers than they are today, and one wonders whether Nadella has made the same determination. Regardless, the clarity in business models is good news.